Your trusted source for Lawn Tractor Parts, Lawn Tractor Accessories and New Tractor Sales. Looking to trim some serious distance? If you have an acre of property or more to cover you should consider a lawn tractor for your mowing needs. A lawn tractor is much more than a typical riding mower because they are built for distance, and there are a considerable number of attachments and accessories that can completely transform the tractor’s functions. Browse our selection of equipment to learn more about the options available and which combination of attachments, accessories and OEM parts will meet your needs. Small Engine Parts - Original Parts for Lawn Tractor Engines | Need a New Engine? Call for assistance and we will get you set up. 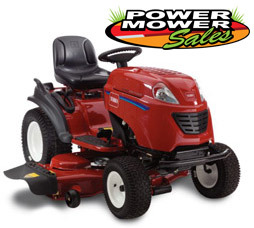 Power Mower Sales is your Lawn Tractor Superstore! We carry all the top Lines and latest Models. Shop the latest equipment at lower prices, and take advantage of our comprehensive customer service. Power Mower Sales supplies OEM accessories and replacement parts for most brands and models of lawn tractors. Shop our assortment of lawn tractor blades, belts, filters, wheels, attachments and much more. Use the links above to guide you to the proper parts diagram in our Lawn Tractor Parts Lookup to find what you need. If you already know your part number, use the quick search bar at the top right to find it fast! If you need assistance finding your model number or a particular tractor part, don’t hesitate to contact us. We are real people, providing real service with over 45 years of experience. Order online 24 hours a day, or call us toll-free at 1-800-704-4241 (Monday thru Friday 8am-6pm EST) and we will assist you.